Sydney Shop Girl: ANZAC Day Reflections. The Wind. Juicy Buns. ANZAC Day 2012 in Darwin. 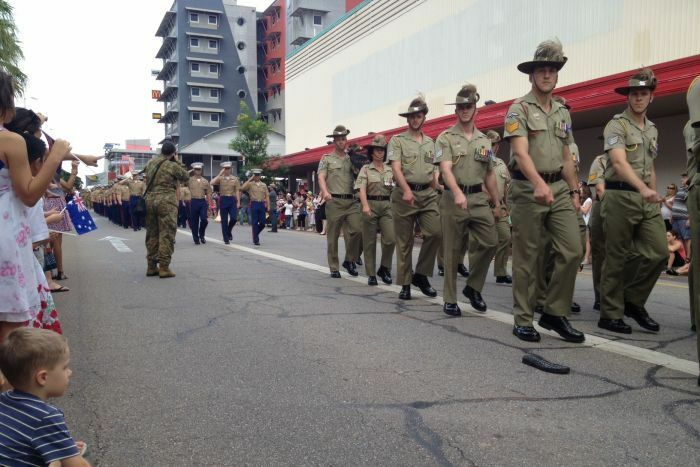 Both American and Australia troops marched together to remember the fallen from both countries. It has been a day to reflect and never forget. On the selfless sacrifices of made in the past, present and future. For me, this is an ANZAC Day with great hope because of the planned early draw down of Australian troops in Afghanistan. As the War Against Terror has dragged on and the doubts about it grow, it's the good and right thing for our country to withdraw from the region. Despite the mixed public opinion on the conflict, I hope that the returned service men and women know that their fellow Australians are behind them and their dedication to service for the country regardless of the prevailing politics. It's also a time where plans are being discussed for the centenary commemoration of ANZAC day in 2015. 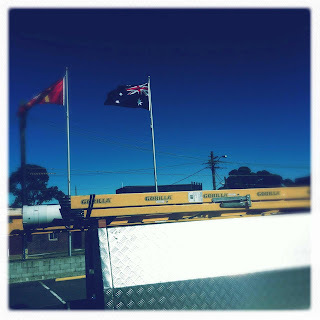 About the need, perhaps, to make it more 'culturally relevant' to the changing dynamic of Australian society. I don't know if anything needs to change, really. I think many of us without actual personal roots to the war effort in Australia still relate very personally to ANZAC Day as it is now observed. I like the current reverence for the past and the recognition of current and future members of our defence forces. We may be in danger of forgetting if we let go of the past. While we've had perfect clear skies for the ANZAC Day services and marches, we've also had howling winds all day in Sydney today. This impacted my life in two ways today. 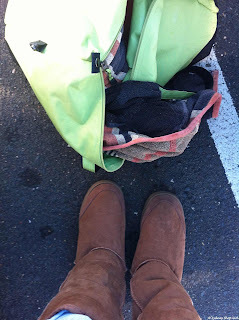 I wore my ugg boots home from the pool for the first time this year. 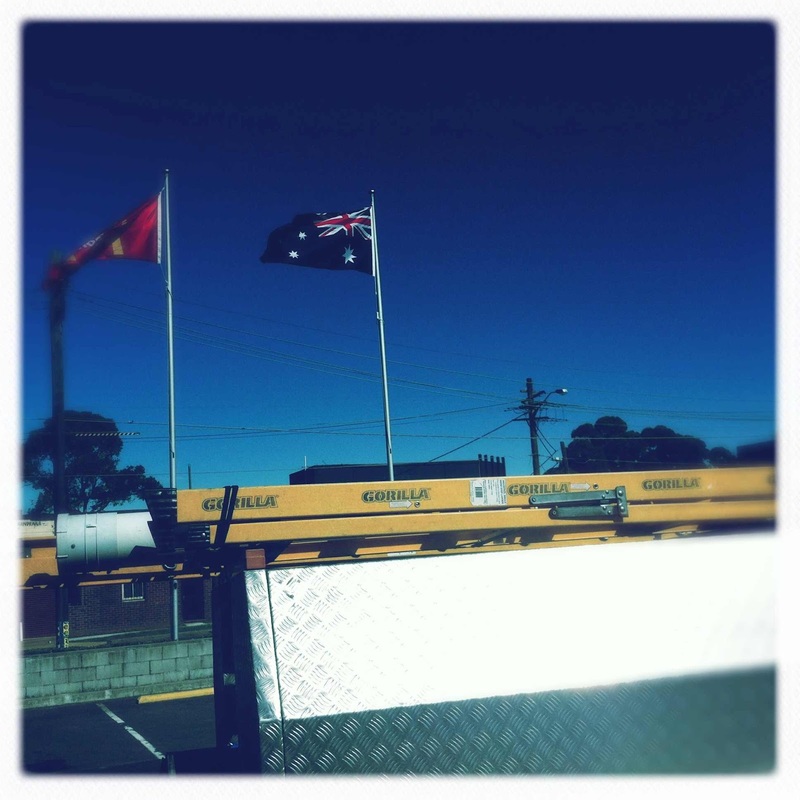 And the gusts of wind snapped the flags at Maccas Up The Road to full attention. McCafe is my go to place for coffee on public holidays. I also needed to refuel with an after swim snack. The price of a box of McDonald Land Cookies has rinse 300% since I last bought a box in 1989. They are Arnott's though. And I know the box says Cookies but in my mind, they will always be from McDonald Land and the tastiest ones will aways be the ones shaped like a bunch of Junior Burgers. I didn't have a chance to see if they still tastes like crispy synthetic shortbread because it was getting late and busy and I had to get home for lunch. My public holidays revolve entirely around meal times, I tell you. On the menu for lunch today was dumplings at home. The thought of lining up at our favourite place in Chatswood was overwhelming. So Mr SSG and I decided to eat in. We didn't make the dumplings from scratch but we got the next best thing from the frozen food aisle of our local Asian grocer. 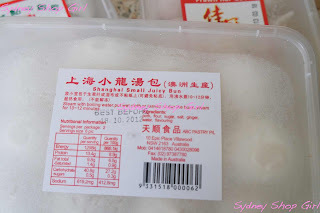 The official name of the dumplings is Xiao Long Bao (the kind you need to pierce with a chop stick before biting or else risk being burned by the hot soup inside) but these are cutely branded Shanghai Small Juicy Bun. Dumpling vinegar and some prawn har gow. 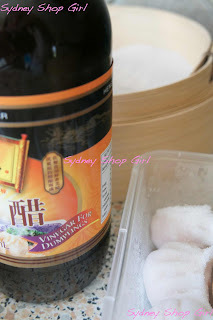 For the complete dumpling house experience, we ate ours with this special dumpling vinegar. For a complete dumpling house / yum cha experience, the table is not complete without a serve of choi sam in yum cha sauce. It's really easy to do at home. Just top your blanched vegetables with a mixture of 2 teaspoons sesame and 1 tablespoon peanut oil that have been warmed. 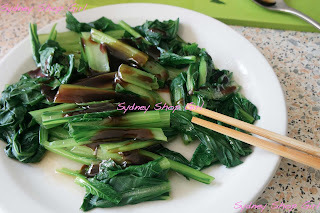 After mixing through the veggies, top with the sauce. 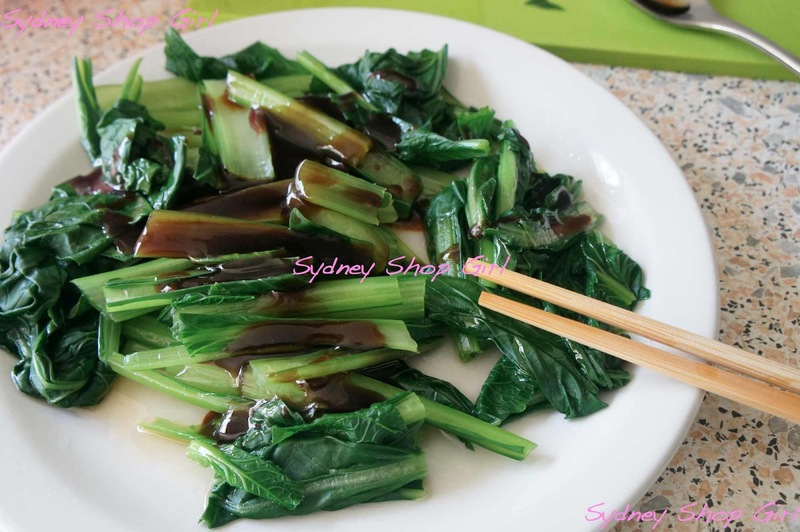 The sauce I use is 2 tablespoons of oyster sauce, 1/2 teaspoon of sugar and 1 tablespoon of soya sauce. There's no need to warm these ingredients. Just stir until the sugar dissolves. I'm also all set for dinner tonight as well. A big crock pot of pork sausage and leek soup is ready to reheat when we feel like eating this evening. It's a big night of public holiday television (even without The Voice) - Offspring and The Good Wife. Hope you're having a thoughtful and relaxing day! Lots of yummy food for Anzac day! We had a very relaxing day too, catching up with sleep after the dawn service. Lovely reflection of ANZAC day and the drawdown in numbers coming. Whilst not on the ANZAC topic, I especially loved the shot of the uggs after swimming, as it brought back memories of early winter mornings of a squaddie. I've been wearing my uggs to dance. Which is terrible because they have horribly stained toes from the various things I've dropped on them over the years, wish I knew a good way to clean them. It was a FREEZING ANZAC day in Canberra, but all the better for a bit of rememberance. Oh, I wish we'd had a dry day for ANZAC Day! We got absolutely soaked at the Dawn Service, and again at the football. It was freezing too! But so worth it. Thanks to the ANZACs at least we're getting soaking doing things of our choice, not while also fighting for our lives!